Experience the Best Seal Beach Burgers nearby on Main Street, Eat steps to the pier. Choose one of ten amazing styles! Hand-Cut French Fries are included. Relax with great service and craft beers on draft in a casual atmosphere. So how are we the best Seal Beach Hamburger Restaurant in downtown? We Ground Sirloin Beef into a patty. Next, comes the Freshest Ingredients. Lettuce, tomato, onion, pickle, AND we top it off with our Delicious House Sauce. Cooked to your needs, it comes with Crisp French Fries! I absolutely adore this restaurant. There are many menu choices and I've never had a meal that wasn't fantastic. After 10 pm it's burgers only — huge but very tasty. I could only finish half of mine. I highly recommend The Hangout. After dinner, cross the street and take a walk on the beach or the pier. With several TVs throughout and the all sports package with big booths to kick back in. There is larger tables to accommodate bigger parties or groups with friends. Our restaurant bar provides the best value & service. Need late night food nearby? We serve burgers until 10:30 pm. Take out is available. Peruse our menu below with 10 Choices! Think you can handle this? Try to stay with me. Double Beef, then Double the Cheese, AND wham! Double Bacon! We stack a Fried Egg, Chili, Lettuce, Tomato, Onion & Pickle with Two Grilled Cheeses as the Buns! Lastly, it's topped off with our House Sauce. Boom! This one is a Hybrid of sorts. We take a 1/2 Pound Hand Formed Beef Brisket & Ground Sirloin Patty, cook it to perfection then top it with your Choice of Cheese, Fresh Lettuce, Tomato, Onion & Pickle. It's as good as it sounds! How about a 10oz KOBE Burger?! It's pretty special! We pile it on high. Fresh Lettuce, mouth-watering Tomato, Onion, Pickle and yes indeed our House Sauce. Grab the napkins, this one can get quite messy! 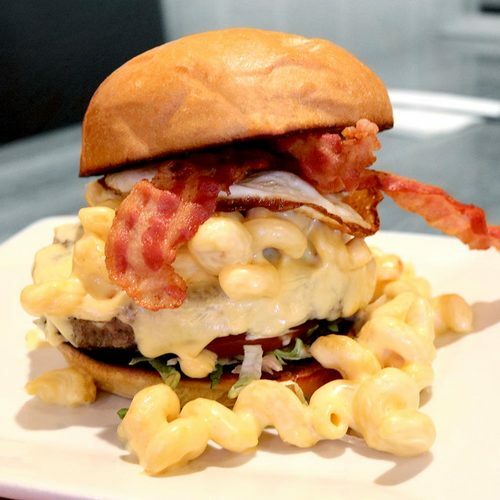 Crisp Bacon, Fried Egg, Lettuce, Tomato & a Heaping Pile of Mac n' Cheese on top! You may want a fork and knife for this Masterpiece! Bacon Egg Mac n' Cheese Burger! The Hangout Seal Beach is a new American restaurant serving amazing hamburgers on Main Street. We're 17 mins from downtown Long Beach. Off the 405 take exit 22. The burger was Great, very flavorful and cooked perfect! We would definitely recommend this place.